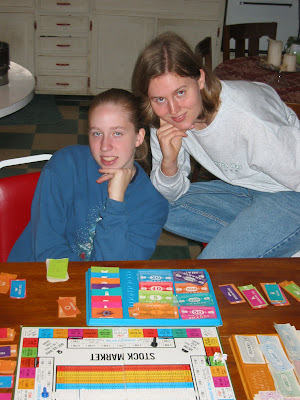 Maidens of Worth: Sibling Snapshots: Games! Family games? Ah yes, I remember it well! Our family used to love playing games, until the main game players moved out and got married. We loved playing Hand and Foot,(a6 deck card game), Pinocle, and Cutthroat Uno. We loved the Dutch Blitz, and also, Phase Ten. WE still love Phase Ten. Board games? WEll, we like to play Monopoly, Scrabble,Chess,In A Pickle, Pictionary,etc. WE love to do that especially around Holiday times when the family is together! That is enough for starters. Need I say more? We love playing games, too. Some of our favorites are: Phase Ten, Nine-Hole Golf, Tuxedo, and Buy It!, and we like Dutch Blitz too, but we don't play it much except when we have a lot of people here. Some favorite board games are: Monopoly, Double Crossing, Rail Baron, Risk, and Huggermugger. There's also Taboo, Guesstures that are really interactive card games. Like Laura, we play a lot of games when all the family is together! I've done alright,though..Luke says he never knew I was so competative! Now we have our children playing them as well! Our favorites are 10 hole golf, battleship, Life and candy land. Aaah...gotta love Dutch Blitz! It would be interesting, as a lot of us blog-readers here have played it, to see who of us is the most experienced at that heart-pumping game! I've played it for years. Our family loves games. They are a regular occurrence at our house. 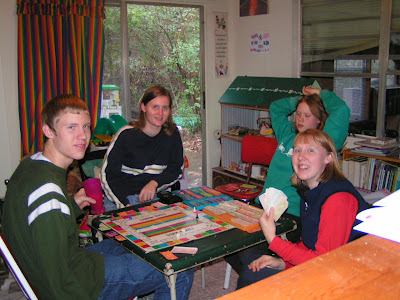 We used to play Dutch Blitz quite often. Now, you find us with Pinochle, or in larger groups, Apples to Apples. Garrett and I play Risk every now and then. He always wins. However, I have never heard of Stockmarket. I think he would get a kick out of that one. Laura, we enjoy Hand and Foot as well! It's neat to hear all of your favorite family games! Most of them I've played or heard of. Maybe sometime we should have a blogger Blitz get-together game. =) We can dream, right? Hi, Anna! You may know me from Ella's blog. I love this post! My family loves playing games, as well! Dutch Blitz is a great one! Alice, thanks for the visit! 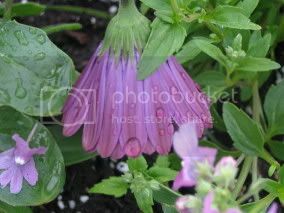 I've enjoyed going to your blog and seeing your comments on Ella's blog. Rebekah, thanks for sharing that funny story! I, too have played games far into the night... sometime you just loose track of time when you're having fun! Dutch Blitz is a really fast card game. You should try it, should you get the chance! Looks like fun! My family loves to have family game nights as well. We also love having our church family over for family game nights! Apples to Apples is a TON of fun with a lot of people! It's hilarious! 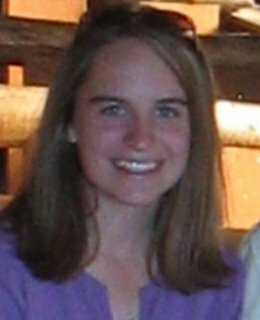 My name is Bethany and I have been visiting your blog for awhile now. I found your blog through The Girl Inside blog. I have enjoyed reading your articles. I'm not very good with long games such as Risk and such... but I don't mind watching other people play. 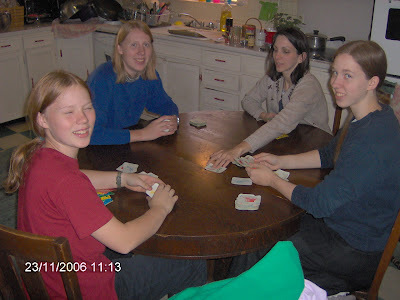 I do enjoy card games like Dutch Blitz and Phase Ten. Well, I like this post! My family really enjoys games, and since there's ten of us card games are great! WE play several of those mentioned: Dutch Blitz, Apples to Apples, Phase Ten, Hand and Foot (SOOOO FUN), nine round Golf, Scrabble, Risk, Scattergories, Monopoly, Chess, etc. We also play others like Rummy, Slap Jack (but you slap more than Jacks), Life Stories, Spoons, Go Fish, Stratego, Pictionary, Probe, The Richest Christian Game, Traverse, Uno, Duo, and many others when we find them. Playing games is a great way to spend family time, rather than watching TV or playing video games, and it's educational AND can help people settle in if their kind of nervous. Hope this is helpful.